Its not a cliché to love ice cream whenever the sun comes out, what could possibly feel more exciting and cooling to eat in the afternoons- walking through parks or sitting on street curbs with your friends. Gillato being the all time indulgent and delicious classic, which originated in Italy and was an all-time treat for us when taken as children; holidays in Lucca, Rome, Venice… always a very authentic treat to go and pick an ice cream with siblings- all the different flavors and colours that tasted so fresh and lovingly homemade. 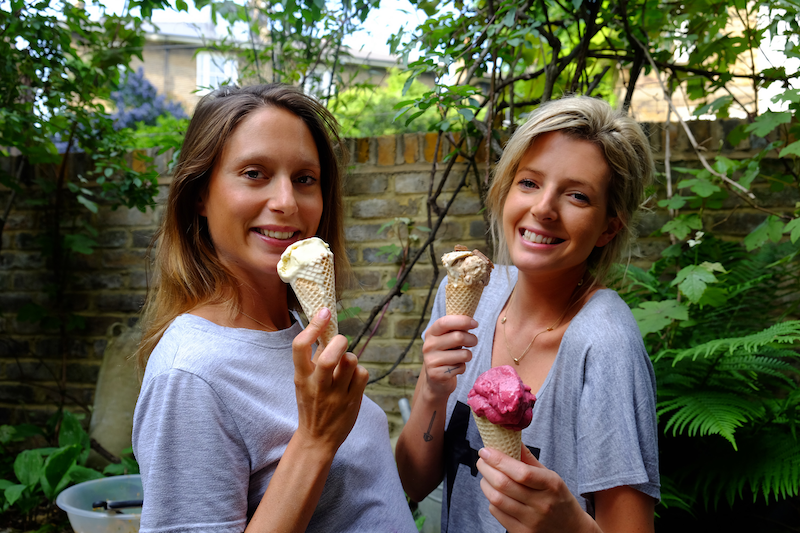 opening our pop up last year in Queens park got us excited about making up new ice creams and frozen yoghurts (froyos), experimenting with different fruit, toasted nuts, chocolate, salted caramel.. even herbs and spices. These are three we loved and want to share. In creating our own we realized we have got so sick of how sugary ice creams are and how much is called for in recipes. Before they get churned into a machine they actually make you feel sick with the high sweetness, we have commented on how they hurt our teeth and tongues. Sugar has been taken to a whole new level in the western diet, its pretty much the norm for most children to scoff packets of sweets and drink fizzy drinks that are loaded with poisonous e numbers, flavoring, and coloring. Our ever-growing addiction to refined sugar is not only rotting our teeth, its bringing about an explosion of obesity, type two diabetes, and countless associated problems. More and more people are making the argument that sugar is the biggest killer of all- so whilst we love ice cream, we try use as little sugar as possible or alternatives to sugar in everything we make. Whole foods now offer quite a good range of healthy alternative ice creams- some for the serious health conscious- ice creams with no dairy and sugar- alternatives like nut milk, date for sweetnest and raw cocao. There coconut ice cream is a new favorite find. Ice cream machine- magimix. Such a bore to buy the ones where you freeze the tub- go straight for the automatic freezer ones. Extra virgin olive oil Whisk your eggs and honey together until fluffy. Add the milk, cream, vanilla, and salt- whisk until well mixed. Place in ice cream maker, and churn according to instructions. When the mixture starts to firm up start pouring in slowly your olive oil in. transfer into a Tupperware and freeze. Delicious serves with a drizzle of olive oil and a little salt. Salted cashew nut, banana, and dime If making your own cashew nut butter- roast nuts in the oven for no longer then 5-10 mins until golden. Blitz in a magi mix until churned into butter- aprox 10 mins. Add sea salt a little maple syrup. Blitz your bananas in the magimix and add the yoghurt, cinnamon, salt, vanilla and cashew nut butter. You should have a smooth frozen mixture. Decant into a tupperwear and fiold in your crushed dime and almonds- leave extra to sprinkle on the top of the mixture. Put into the freezer. Summer berry froyo Blitz your bananas in a magimix, add the yoghurt and then your frozen raspberries, honey, vanilla, and basil. Place into a tupperwear and then into the freezer.